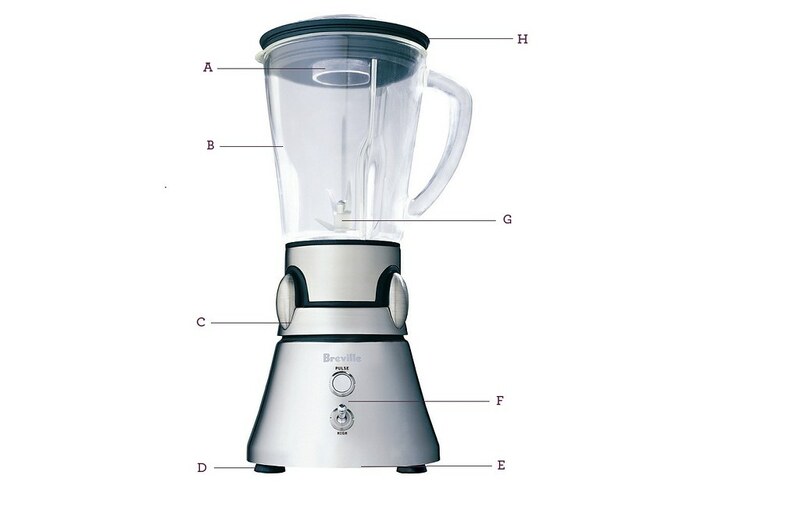 The Breville® Moda Blender™ – The professionally designed blender for commercial style results. With a 6 way blade assembly, locking glass pitcher, and stainless steel body, it can handle what ever your blending and look beautiful doing it. A. 2 fl. oz. Inner Lid/Measuring Cup. B. Lockable 1.4 Quart (1.3 Liter) Glass Jug. C. Stainless Steel Base. D. Non-Skid Feet. E. Motor Protection Reset Switch. F. Two Speed Selector Switch with 'PULSE' Button. G. 6-Way Blade Assembly with Locking Ring. H.Sealed Lid.